Permaculture on the whole is obsessed with self-regulating systems and designs that, when mature, require little to no human input. One of the founders of permaculture, Bill Mollison, famously struts around in his early videos talking about how with good permaculture design, the “designer becomes the recliner”, and can laze about nomming garden goodies, instead of doing any further back-breaking labor like weeding, fertilizing, controlling pests, tilling, etc. I've also heard knowledgeable permaculture designers say that the hammock is the most important feature on their land (observe and interact!). I can imagine people not familiar with permaculture balking at such claims, so I wanted to delve for a moment into the pursuit of optimal behavior, as related to food production and beyond. The penultimate permaculture food system is often described as a diverse polyculture that fully maintains itself or does so with miniscule human intervention. The designer/farmer then only has the task of harvesting the abundant food at appropriate times. Think of it like living in a giant free green vending machine that provides consistent way-beyond-organic produce for you and your family to eat. Pretty epic, right? Is this a pipe dream or a reasonable approach to providing one's own food? According to numerous documented examples around the globe, such a system IS possible. It apparently takes between 8-12 years for most forest garden systems to reach their “climax” point, where it is running at full capacity and self-perpetuating. And by using intelligent regenerative land management, your forest garden will increase in fertility each year... just imagine what that will look like generations down the road. Awesome. So this isn't just a pipe dream after all- this is seriously awesome land cultivation done right. I started to ponder other systems that highly value efficiency, to see how this concept is reflected in other fractals of our human experience. The first thing that came to mind was martial arts. Certainly in martial arts efficient movement is key to everything- wasted energy can lead to loosing a match or not quite dodging that kick headed to your face. I know from my experience in fencing that the entire art evolved into a linear “strip” because sideways movement was understood as inefficient- forward and reverse movements essentially “trim the fat” and deal with the most important aspect of a match, which is the distance between you and your opponent. So efficiency seems to be a sign of a mature system, whether it is a food forest or a martial art. Let's look a bit deeper at martial arts. 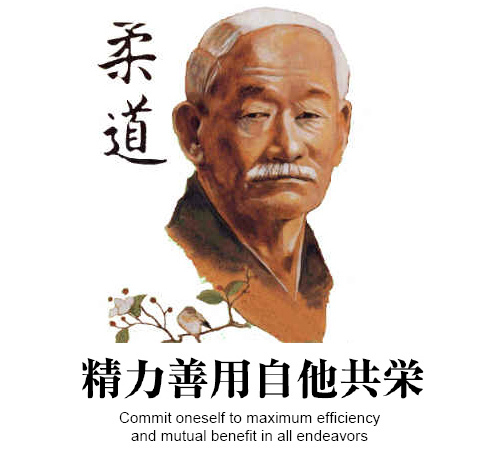 You would be hard pressed to find a more venerable and respected figure in martial arts history than the founder of Judo and father of Japanese physical education and sport, Dr. Jigoro Kano. One of his most famous axioms is “Commit oneself to maximum efficiency and mutual benefit in all endeavors.” Could there be a more resonant quote from an unrelated field about the basic philosophy of permaculture? Here, not only does Kano describe efficiency, but also the basic permaculture ethics ("mutual benefit" is essentially Earth Care, People Care, and Fair Share). I am continually amazed at how the concepts embodied in permaculture are reflected all over human experience, and that is why I so deeply believe it is a critically important seed of our new permanent human culture.